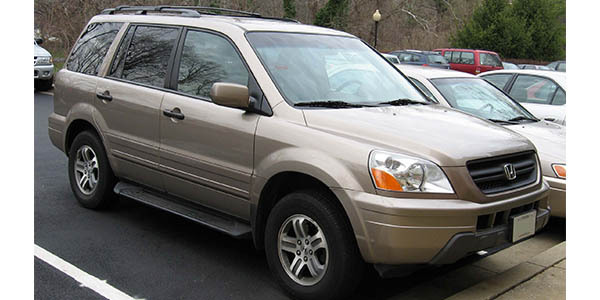 Honda’s first generation Pilot was one of the first mid-sized crossover SUVs on the market and was designed to fill the demand for SUVs larger than a CR-V that drove like a car. Manufactured in Alliston, Ontario, until production was moved to Lincoln, AL, in 2007, the first generation Pilot shares its platform with the Accord, Odyssey minivan and the Acura MDX. More than 700,000 first-generation Pilots were sold, so there are a lot of them still in service and that need brake maintenance. These mid-sized SUVs employ four-wheel disc brakes with ABS and vehicle stability assist (VSA), to help with traction control. In March 2013, Honda issued a recall for 182,000 vehicles, including the Pilot with VSA, due to unintended braking issues. According to NHTSA, the problem appears to be related to activation of the VSA when it shouldn’t be activated. The VSA assists drivers in emergency braking situations by applying maximum braking force when a panic stop is detected. Owners who experienced this issue said their vehicles went from highway speeds to a complete stop without warning. According to Honda, there are two potential reasons why the VSA will initiate without driver interaction. One reason may be if the VSA control unit is damaged, it may cause the system to misinterpret the signal and trigger the system to unexpectedly apply the brakes. Other Pilot models may have a loose ground bolt, and the increased resistance may also cause the VSA unexpectedly engage. Replacing brake pads and rotors on the early model Pilots is simple and straightforward for most shops. 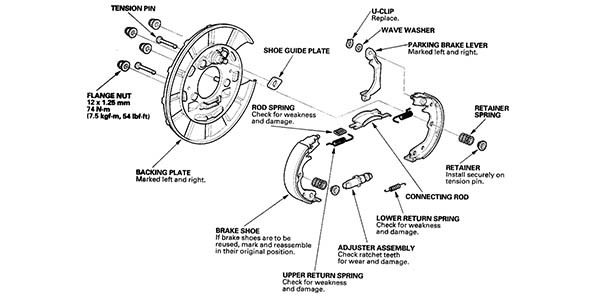 These vehicles tend to build up high temperature in the brakes and cause runout in the rotor and hub. The VSA issue may also contribute to some of the wear issues owners have reported. Brake pads thickness should be 0.41-0.45 inch in the front and 0.37-0.41 inch in the rear with a service limit of 0.06 inch. Rotors should measure between 1.10-1.11 inch with a service limit of 1.02 inches in the front. Rear rotors should measure 0.43 – 0.44 inch with a service limit of 0.35 inches. Honda says runout should be 0.004 inch or less. 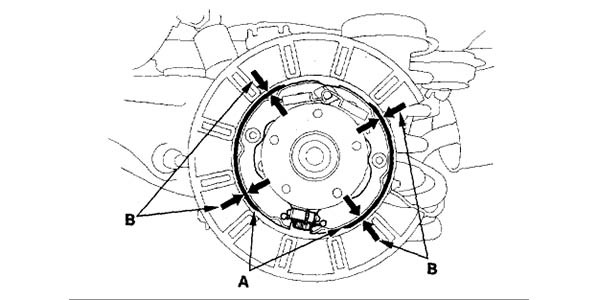 It is also recommended that you resurface the rotors on the vehicle, if possible, so that the rotor and hub are true. 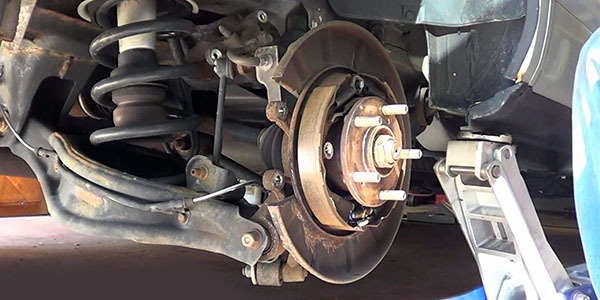 If you are surfacing off the vehicle, check for trueness with a dial caliper after the rotor has been installed and index the hub flange to the lowest position. Be sure to also inspect the hub for play when you’re measuring runout with a dial indicator. The parking brake sits in a drum inside the rear rotor hat. 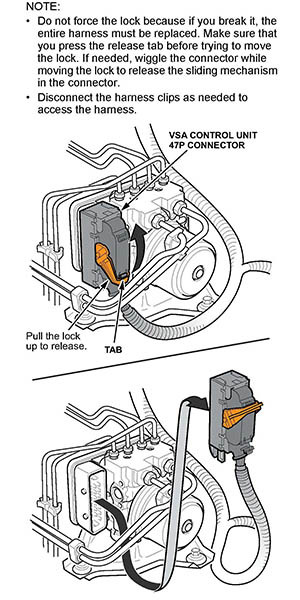 To adjust, press the parking brake pedal down until it is in the locked position noting the number of clicks. The parking brake pedal should move four to six clicks. If the number of pedal clicks is excessive, adjust the parking brake. To do this, remove the access plug and turn up the ratchet teeth on the adjuster assembly with a screwdriver until the shoes lock against the drum. Then back off 10 clicks, and install the access plug. With so many first-generation Honda Pilots still on the road, shops should continue to see these vehicles for years to come. Front Caliper Bracket Bolts: 80 ft./lbs. Front Caliper Guide Pin Bolts: 27 ft./lbs. Rear Caliper Bracket Bolt: 80 ft./lbs. Rear Caliper Bracket Bolt: 27 ft./lbs.